This tutorial details the use of the monitoring mode of the Anteater, which works independently of the flow or packet information production. It was originally used to give the user an intermittent report and thus a decision base if large pcaps in the Tbyte regime were processed. Then it evolved into remote controlled and autonomous multi-sensor reporting and monitoring where an admin once configures T2 and deploys it on a machine listening on an interface. In this tutorial we will discuss all aspects of T2 reporting. In order to do so, we need to prepare T2. If you did not complete the tutorials before, just follow the procedure described below. First, restore T2 into a pristine state by removing all unnecessary or older plugins from the plugin folder ~/.tranalyzer/plugins and compile only basicFlow, basicStats, tcpStates, ftpDecode and txtSink. The -e option for t2build also leads to the subnet file for geolocation being regenerated when building basicFlow the next time, which can take a bit of time. The anonymized sample PCAP being used here, can be downloaded here: faf-exercise.pcap. Please extract it under your data folder. Sniffing directly from the interface is required, so have your sudo PW ready. Now you are all set for T2 monitoring experiments. Have two bash windows open. One where you start T2, and another one where control signals can be sent from. Start T2 on your interface. If you do not know the name use ifconfig or ip link and use the -i option. Note, sudo is required to gain access to the interface. Because your tranalyzer binary was built under your account, the -p option is required. It tells T2 where to find its plugins, in our case in the wurst user home directory. Just swap it with your home directory. To make life simpler for you, benoit added a st2 command for you for such purposes, so you have no hassle with the sudo and that there are normally no aliases defined under your root account. It also takes care of the location of your plugin directory, hence the parameter: -p /home/wurst/.tranalyzer/plugins/ can be omitted. Now switch to the other bash window and invoke the USR1 command. The command t2stat has the same effect. You will then see the following output in the T2 window something like this, if you once invoked a t2stat. If you used the USR2 command, or t2stat -s -2, every second an intermittent anteater report will be printed until you send another USR2 signal. Note at the beginning USR1 A Type denotes that there was a signal received and all reporting is aggregated _A from the beginning of T2 operation, almost like the end report. There is also a differential mode, s. next section. To switch from reporting to machine compliant reporting set MACHINE_REPORT 1. 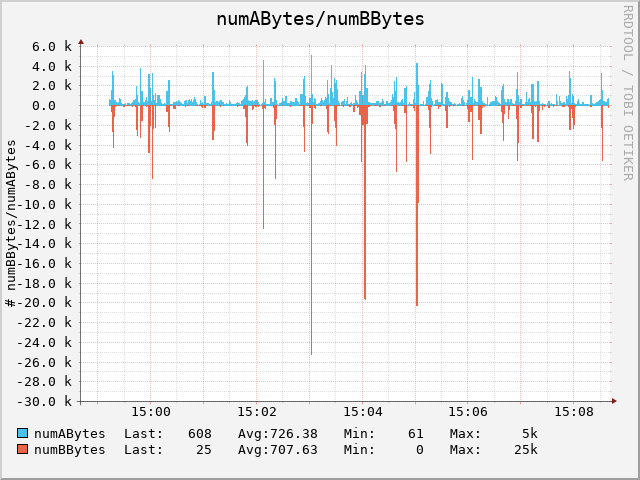 The monitoring output is by default aggregated over time, like the end report. Switch also to the differential output mode, which is mostly used by reporting tools, such as RRD Tool. Then, the counts and changes are sampled in a certain time period, by default 1s. So set DIFF_REPORT 1. The PLUGIN_REPORT enables the monitoring output in the plugins. We leave it on. If you switch it off you need to recompile with t2build -R because code has to be removed from the plugins. and execute the line of the last section and trigger t2stats then you will see the following output, which looks now more script friendly. If you switch to VERBOSE 0, you have to recompile all plugins with t2build -R, because all plugins have also a VERBOSE switch dependend code base. Now T2 and all plugins are mute. This option is good if you once compile T2 to do a job in a network, but if you are more the research like guy the -l option is a much better choice. It reroutes all the endreporting into a file yourinterface_log.txt. Execute the st2 command line again and trigger some USR1 or USR2 signals then you will see the following output, which is more script friendly. Same signal sequence was used as above. Now all end reports from T2 and the plugins are routed into the log file. T2 still produces flow and other plugin related files to your results directory. If you are only interested in the monitoring output unload txtSink and T2 becomes more perfomant on the monitoring task, because the flow write process to the disk is omitted. And you do not need to supply the -w option anymore. You can also use the BLOCKBUF switch in tranalyzer.h, disabling all flow output generation, making T2 even faster, which we will discuss later. For the time being we are good so far. If you were only interested in remote controlling the T2 monitoring process, you have your wish now. Nevertheless, in case of pcap processing, or time series generation for research purposes we need to talk about time bases and other nitty gritty functionality of the Anteater. Open main.h under trunk/tranalyzer/src and skip to the Monitoring mode section; it looks a bit confusing, but it combines several different operations. Don’t worry I’ll talk you through. #define MONINTTHRD     1 // Monitoring: Threaded interrupt handling. #define MONINTBLK      0 // Monitoring: Block interrupts in main loop during packet processing, disables MONINTTHRD. #define MONINTPSYNC    1 // Monitoring: Synchronized print statistics. #define MONINTTMPCP    0 // Monitoring: 1: pcap time base, 0: real time base. 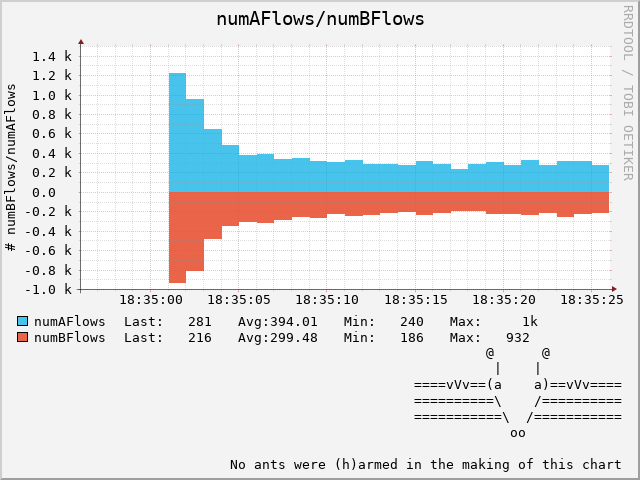 #define MONINTV        1 // Monitoring: GI_ALRM: MONINTV >= 1 sec interval of monitoring output. The first two constants MONINTTHRD, MONINTBLK control the monitoring and reporting process, either via a thread or integrated into the cores main loop. These modes were introduced, because the libPCAP showed instabilities on certain platforms in the past if unix signal are involved, when operating on an interface. These bugs are fixed by the libPcap crew, so the BLK mode is not needed anymore. If you do not like trheading, you can switch to INTBLK mode. The rest of the earth’s population can stick with the default setting. The next MONINTPSYNC controles the location of the print operation, either in the signal interrupt routine or synchronized to the packet processing at main loop level. If you sniff on an interface which has almost no traffic, but you require every 1 sec a report, then set MONINTPSYNC 0. Otherwise, leave it at 1 because then the packet processing is always priortized and thus more performant. So default setting is good for us. The constant MONINTTMPCP defines the time base of the monitoring process; either pcap time, or real time. If you read from a pcap, which may consist of many days of packet capture, you can simulate a monitoring signal, if MONINTTMPCP **1**. On an interface T2 will then also produce a stream of monitoring output because the pcap time is then the real time. So let’s set MONINTTMPCP **1**, pcap time rules. If in realtime base MONINTTMPCP_ON defines whether T2 starts monitoring right at startup or waits for a USR1 or USR2 signal. Will be discussed later. MONINTV denotes the default monitoring interval in seconds. Let’s set it to 10, so that we do not produce so much output from our test pcap: faf-exercise.pcap. The Monitoring mode protocol stat section denotes the protocols T2 outputs. MONPROTMD defines the type of header output, ether protocol numbers or the human readable names, which is the default. If you like to write your own postprocessing, protocol numbers might be better a better choice. MONPROTL2 / MONPROTL3 define the protocols, which should be monitored. Later we will add some more. For the time being we leave everything as default for the time being. Note, that every plugin can contribute to the monitoring mode, as in the endreport. So loading new plugins might produce new columns. So summarizing the config we need to make: We switch to pcap based, and set the timing interval to 10s. So it has to look like this. #define MONINTTMPCP    1 // Monitoring: 1: pcap time base, 0: real time base. #define MONINTV        10 // Monitoring: GI_ALRM: MONINTV >= 1 sec interval of monitoring output. And apply t2 to the pcap you downloaded before. As we produce no flows anymore, the -w option can be omitted, and we do not need to be root anymore because we operate now on our test pcap. Look at the duration column, you see several packets comming on a 0.3s-1s basis until packet number 200. There the duration interval jumps by 18252.71sec. Hence, there was no packet in between. Since we are in pcap synchronization mode: MONINTTMPCP 1, the monitoring is synchronized to the packet dissection, so you will not see samples every 10s, which you could expect at an interface in realtime MONINTTMPCP 0. If you need to sample the monitoring output for later decent signal processing, a small awk script will do the trick; have a look at the encrypted traffic mining tutorial. With a pcap you have to live with these gaps in the output. No Packets, no monitoring in pcap time. If you have a pcap with regular packet flow, all is fine. So the reader may try skypeu.pcap and see a nicer spacing. Recompile t2 and restart T2 and send a USR2 signal. Recompile T2 and test. We will now look a bit deeper into time bases and interface operations. Again, on an interface it normally does not matter whether a pcap or real time base is choosen, unless the average packet rate is very erratic and sometimes is 0. Then it is beneficial to use the default real time base: MONINTTMPCP 0. Hmmm, so a pcap which processes 1 minute would then indeed generate monitoring output, but only on your time base uncorrelated to the pcap time. The same will happen on an interface if there are traffic gaps. The solution is to switch to real time, MONINTTMPCP 0, and interrupt printing: MONINTPSYNC 0, so printing is not synchronized to the core main loop containing the blocking pcap functions. Moreover, we like t2 to start immediately after invokation with the monitoring processes, so set MONINTTMPCP_ON 1. #define MONINTPSYNC    0 // Monitoring: Synchronized print statistics. Recompile tranalyzer: t2build tranalyzer2, invoke T2 on an interface, bind him just for fun to cpu 1 -c1 option, so he won’t jump to others directed by the operating system. Now T2 starts right away with monitoring output and you will see almost an equal spacing of 10sec. That the difference is not exactly 10s can be ascribed to the fact that the minimum precision of the internal timebase is seconds. In future this will be addressed. Now control the two independently by the kill command. If you use t2stat, it will send the same signal to both. That exercise is left to the reader. Let us now concentrate on the practitioner who likes to send logs to centralized machines processing them with his preferred tool. So how can he log into tools residing on a remote machine? An easy way to log into remote machines is to use netcat. Open a bash and start a netcat listener port 5555. We use the local interface to make it easier for the users, who have no access to another machine. If you want to send it anyway to another machine, just swap 127.0.0.1 with the ip address of your remote host. And mind your firewall policies. In the listener bash window, lines should now continually appear. These can be stored into a file or piped into a logging tool such as RRD. Let’s try that. Download RRD Tool and install it. You can watch now while you are working, add more rrdplot to display other colums.